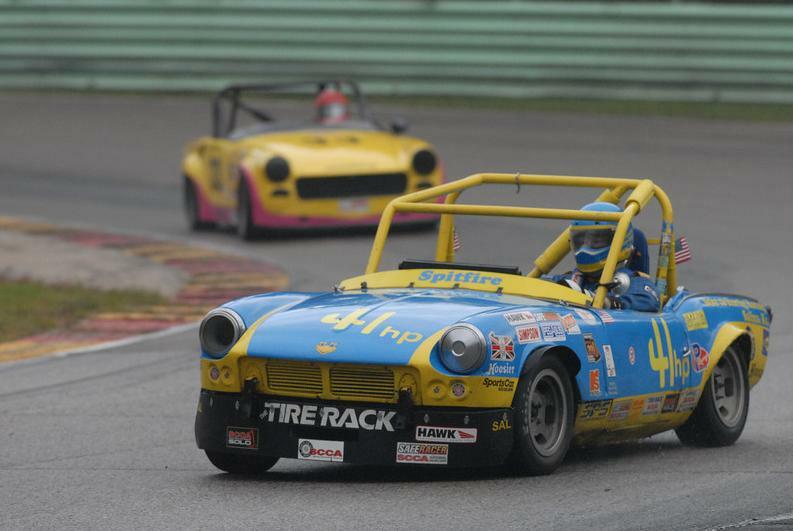 If you are interested in SCCA road racing, real wheel-to-wheel racing, we can point you in the right direction, whether in a Spec Miata or Improved Touring car on a small budget, or a Formula Continental or GT1 Mustang (Trans-Am type) on a money-is-no-object expense account. Salina Region does not put on road races, but we have members who are racers. We’ve got answers (or can find them) for your questions. E-mail one of our senior members (that’s his blue and yellow Production-class Spitfire above). Our nearest track is Heartland Motorsports Park in Topeka, which runs two or three SCCA race weekends a year. These events may also include Track Events (formerly Performance Driving Experience or PDX), non-competitive events where you can run your street car in a controlled environment at speed on the track. The Track Event, which is always a driver school context, has strict safety and passing rules (no actual racing with other cars) that makes it a very safe way to go fast on a real race track. Track Night in America, a program of Track Events on weekday nights. Heartland has several each year. Midwest Division Time Trial Series, competitive events with five or more sessions as part of most race weekends, leading to a season championship. Also, there are three more road racing tracks within an easy 3½-hour drive of Salina – Hallett Motor Racing Circuit west of Tulsa, Motorsports Park Hastings in Nebraska, and Raceway Park of the Midlands in Iowa south of Omaha, Neb. Easy to do races at these and still be home before nightfall. Many SCCA members enjoy attending these events as race officials/workers – the people in the white suits who come to an errant driver’s rescue, or the officials in timing or grid or the starters or stewards. A road race needs dozens of people each weekend to put the event on and they are always glad to have newcomers. The Write Line is Now Online!